RAMPART is a Female Fronted Heavy Metal act from Bulgaria, founded in 2006 and led by the singer Maria Diese. Many worthy musicians gave their contribution in building this fortress of Metal on the Balkans. After 4 full length studio albums and touring in most of the European countries, showing up on different festival stages and because of the classic songwriting, RAMPART managed to establish their position as one of the hardest working bands of the genre. Have you played in any band before? Maria: Every musician from RAMPART had played in other bands before. I have always believed that heavy metal is a road ahead. When you play metal you often need a new beginning. Every musician who chooses this way should give something to enrich the style. This philosophy of mine includes lots of components, inspirations and critics. That is why our line up has always included people devoted to metal and loyal to its ideas. How they began to enter the field of music? Maria: You are not becoming a metalhead – you are born to be a metalhead! I entered the field of metal music when I was 10 years old. We will always say “NO” at the moment! We will always be less than the others, far from the pop-culture, from the TV life! I feel the whole metal as a support and as a source of power. It inspires me and it makes me believe. Velislav: When I was 12 years old my parents took me to show of my uncle’s band (Fireball), for he is also a drummer. I got interested in the moment I saw him in action behind the drum set. For me this is the moment I entered the world of rock. What's your name? / Who plays what? / How old are you? Maria: Now we have new players in the team! 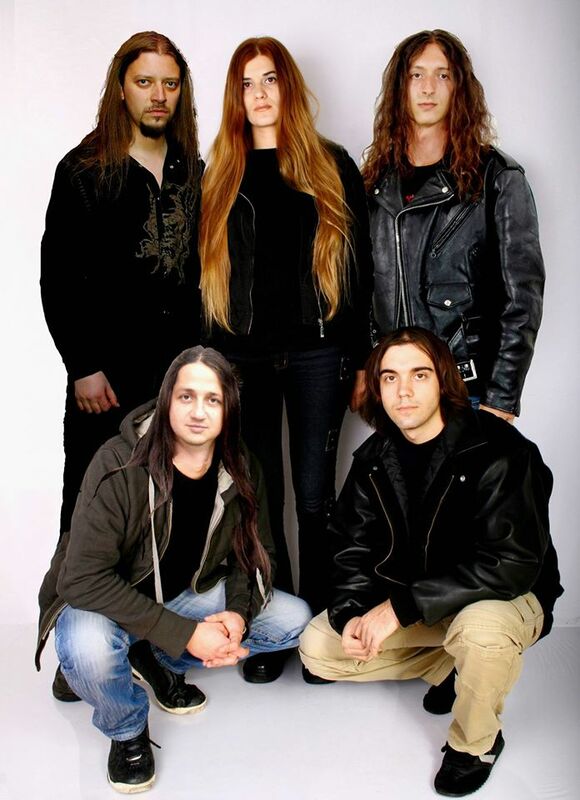 The new members of RAMPART are Nikolay Atanasov on guitars and Biliana Dobreva on bass. I am surrounded by people who are making a lot for metal… I have always believed that the family of RAMPART is open to everyone who contributed to our ideology. I think that this line up is a stable and successful team! Have you had previous members? Maria: For the last 10 years many worthy musicians gave their contribution to build this fortress of Metal on the Balkans - RAMPART. The list includes more than 20 names. Some of them are not active nowadays. I keep relations with most of them and we collaborate for new music ideas but lots of them now live in the USA and the UK, which prevents them to be in the front rows of our army. Did you do music already when you were small? Maria: We are making music all the time. Some of the current band members are under age. They are prepared to step on the road of heavy metal by their parents and relatives. Their devotion and desire for development in this field guarantees the fresh ideas and the future of the band. Where are you from? Nikolay: We are from Sofia, Bulgaria. I'm currently living in Denmark, so I am traveling to Bulgaria when it’s needed to… So I am the missing element in the most of the time! What year was started the band? Maria: The band started in 2006. I was singing in three metal bands before and I knew that the main problem is to find out serious musicians who would consider the band activities more important than the party. Today, after five official releases we are not only the holders of the idea “Rampart” but also a metal family. What music style do you play? Biliana: We are keeping the framework of the classic heavy metal but at the same time we aim to achieve contemporary sound. In this direction the lyrics require more complex musicianship. This makes rhythms diverse and the melodies complicated. The ideas are multilayered. We are trying to keep the good old heavy metal alive! Velislav: Throughout the years I went through various music styles and bands, but the ones that made the crucial impact on me were bands like Sabaton, Eluveitie, Megadeth, Death and of course on the other hand, others, like Lynyrd Skynyrd, Molly Hatchet and most of the classic rock bands. Nikolay: Personally I'm truly inspired by the passion for metal music!! Maria: Our inspiration comes from the world around us, from the approaches we understand it and from our vision for the ways we can change it. We are a social engaged band and we express our positions with music and lyrics appropriate for each different idea or song. The rest could be explained only be the means of your ears! How often do you rehearse? Velislav: Anytime, anywhere, whenever possible. The huge variety of bands and styles that I listen to and play along with helped me to develop my own drumming style more or less, with much more to improve. Do you use earplugs when you appear? Velislav: Yes, I often play with the so-called antiphones. How have you evolved since you started with music? Nikolay: With practice, practice and practice... Have no life, don’t spare your time with stupid things and do something useful such as practicing your instrument!! Maria: We are more skillful and confident walking on the road of metal we have chosen. Now musically we have more freedom of expression. Our expectations our music to cross the boundaries of our country are reality. Our albums provoke serious interest amongst the heavy metal fans and we succeeded our music to reach their hearts. Do you have any other interests or jobs outside of the band and the music? Maria: I write my book “Apocalypse over Europe”. It’s about our tour, supported by Wacken Foundation. We would like to thank them for the inspiration which they are for us. The book is describing the incredible kaleidoscope of impressions we gained and the richness of different experiences in the United Kingdom, France, The Netherlands, Germany, Belarus, Spain, Italy, Turkey, Serbia, Greece, Romania, Belgium, Sweden, Denmark, and of course – Bulgaria. We were continuously chased by the feeling of empathy with the audience and the sense of Apocalypse right at our heels. These fatalistic emotions also inspired the opener of our new album “Codex Metalum”. The book will include a bonus CD with early live concert of ours at London. Nikolay: Me not really.. I’m mostly only concentrated on the music. Are you looking for the booking company, what are your thoughts and requirements around it then? Maria: We are not looking for booking company. I already work with two companies. And if a new one is needed it will find us. As the manager of the band I can say that I am quite satisfied with the work accomplished the last years. We are constantly planning concerts, so wait for us and stay loyal to metal! Are you looking for record labels, what are your thoughts and requirements around it then? Maria: We are not looking for record labels. For our latest album “Codex Metalum” (2016) the Berlin based label Iron Shield Records proposed us very good conditions. The label fulfilled its engagements toward the qualitative parameters of the release. The cooperation between our band and the label is excellent. From now we hope the fans to judge the new album! What are your songs about the whole? Maria: Besides the historical topics and legends I often like to use subjects from the real life matters or social topics which I interpret to metaphoric stories for easier perception. Who writes the lyrics? Who does the music? Maria: The monopoly on the lyrics is mine. The main music ideas for the songs have different authors. Who writes the initial idea then has the final word toward its realization. The team work shapes the song. The band worked in such a way till now. But the practice speaks that in such a way the mistakes are accumulated on the principle that everyone loves his vices. Some defects of the final product are also a result of wrong concept and not enough experience of the composers. That is why now I control the process more strictly. When you do a song, you start with the music or the lyrics? Yavor: Now we use both approaches with maximum result. Do you play only original songs live and also covers? Velislav: We play original songs. 100 % of our play set consists of our own material. But sometimes the crowd needs a cover song, and if it is noisy enough we satisfy this wish. What language are you singing about? Maria: I am singing mainly in English. For the die-hard fans in our country I recorded our third album in my native language - Bulgarian. For our very new and hot album about the WWII coming out in 2017 besides the English I use a little bit Russian and a little bit German. What about your concerts? Maria: Indeed in the last four years we are very active and we play many concerts all over Europe. The concerts we had in the beginning of 2016 in Denmark and Sweden as a support band to UDO DIRKSCHNEIDER and ANVIL are really memorable for us. We had a great time on these stages not only because the audience was really crazy and very active but also because of the good words and the support we received from UDO and ANVIL. What bands have you played with? Maria: We had the pleasure to share the stage with bands like QUEENSRYCHE, FLOTSAM AND JETSAM, ANVIL, UDO DIRKSCHNEIDER, SCANNER, BLAZE BAYLEY, SUSPERIA, HATE, ARKONA, WITCHBURNER, GODSLAVE, CRIPPER, GUARDIANS OF TIME, PICTURE, LONEWOLF, IRON MASK, WIZARD, and many more. Do you play always the same songs live or vary it? Maria: We often vary the songs. Till this moment we have four albums released. This is more than three hours of our own music. For our longest set we played 2 hours. It is not possible to play them all on concert. Where have you been playing this year? Maria: This year we played at: Aarhus (Denmark), Malmö (Sweden), Gothenborg (Sweden), Sundsvall (Sweden), Stockholm (Sweden), Lugoj (Romania), Sofia (Bulgaria), Nis (Serbia), and Eindhoven (Holland). Which countries have you played in? Maria: Sweden, Denmark, United Kingdom, France, The Netherlands, Germany, Belarus, Spain, Italy, Turkey, Serbia, Greece, Romania, Belgium, and of course – Bulgaria. When did you sell merchandise? What are your merchandise gadgets? Where can I buy your merchandise? Maria: Usually we are selling our merchandise at our concerts. We have CDs, T-shirts, patches and some surprises. You can also make an order online from our Bandcamp page. What do you think about downloading more music than buying CDs nowadays? Velislav: We live in a new modern era, where everything is one click away from us. Yes, we have all downloaded music but the idea is to support the artist we like in more than one way. If you prefer downloaded music, cassette, CD or Vinyl? Nikolay: It is good that nowadays everything is on by hand and you can listen free to stuff you want to. But it is actually not the same feeling like it was before when you buy your music. There is so much more passion in that. So I will say I would prefer to buy my music when possible.. Support metal bands and buy their music! What are your role models or idols? Velislav: Well, there is a lot to say here but I’ll try to be more specific. First of all, Ian Paice of Deep Purple was the first drummer that really got me in the main techniques. Others that inspire me are Merlin Sutter, Hannes Van Dahl, Daniel Mulback, Jukka Nevalainen, and last but not least, my uncle – the man who got me into drumming – Slavi Kerkenekov. Maria: I believe that Kai Hansen is the best vocalist of Helloween. This is my example for best vocalist and best guitar player. I also admire the voice and the techniques of Udo Dirkschneider. Besides the names from the heavy metal scene I am a big fan of Testament, Kreator, Laaz Rockit and many more. But no doubt that the biggest voice in my metal world is Dio. Is it easier to draw inspiration from older bands than bands that are active today? Nikolay: Especially for me it is easy to draw inspiration from older bands because they are more similar to our style.. We are mostly an 80's traditional Metal band so.. But we like some newer bands too!! And most of the (well known) old bands are still active today, so..
Maria: No matter how strong is our liking to the music of our metal gurus from the 80's being a band for more than 10 years we have cleared a distinguished face as a formation and we already have our own style. We like the old bands and we like the new bands but as I said we draw inspiration mainly from the world around us. The framework of heavy metal may seem restrictive but now we have the skills and the will to go ahead on our own way. What do you think of my work? Yavor: The inert disinterestedness toward the band you are interviewing and the standard questions sent to everyone make your work automatic like a menu order in the social kitchen. The too many questions, most of which are unnecessary, speak about the lack of real inrerest to your work. In this type standard interviews only the wish of the band to make the article interesting will lead to somewhat result! Your approach evidently kills the desire of many musicians to think on their questions. That’s why they answer you like coffee machines... Do you like your publications? You respond for yourself. How believe and know that this interview will help you in Brazilian music? Yavor: We do not plan any of our future albums to submerge in the samba and that’s why we do not expect essential effect from this interview in Brazil. Even more that till this moment we did not touch the public there... According to our distributor there in November we surpassed by sales Thomas Quasthoff, Еddie Meduza and Ultra Горски Krieg but we are far after Depeshe Mode, ABBA и Tokio Blade! What has been conditioned biggest obstacles in the music industry? Maria: The biggest obstacle in the music industry is the desire for control over the super profits of the labels that do not cope with the changed realities. Other obstacles are the restrictions over the market imposed by the monopolists and the state restrictions. What advice would you give to other bands and artists? Maria: Work hard and follow your dreams! Do you have new material in grams? Maria: We are in studio recording a brand new album. Itstitle is „Memories for the Future” and it is planned for release in 2017. The main topic line of all its lyrics is concept and features less known historical facts about the World War II. We keep the direction of making fast dynamic songs with evident own specific melodies. What are your plans for the future? Maria: We expect the number of our concert engagements to increase. Our new album “WWII: Memories for the Future”will be released in the upcoming year. Besides this studio album we expect our live album recorded at London to be released and the book about our tour “Apocalypse or Theater” to be published. Do you have anything to add? Maria: RAMPART means fortification and we consider ourselves defenders of the heavy metal. We intentionally cleared up different influences, because we want to address our message directly. The name of the band is a reflection of our disposition in the world. We hope that your readers will listen to our music and judge it by its merits. We wish you a new metal year full with tons of good mood and good music!